Today, fashion has not just restricted to trendy clothes and accessories. Instead, it has gone far beyond to attractive hairstyles, nail arts and various others. With these extra attributes, you can get a unique look that compliments your outfit and gives you a gorgeous and an outstanding look in front of the crowd. 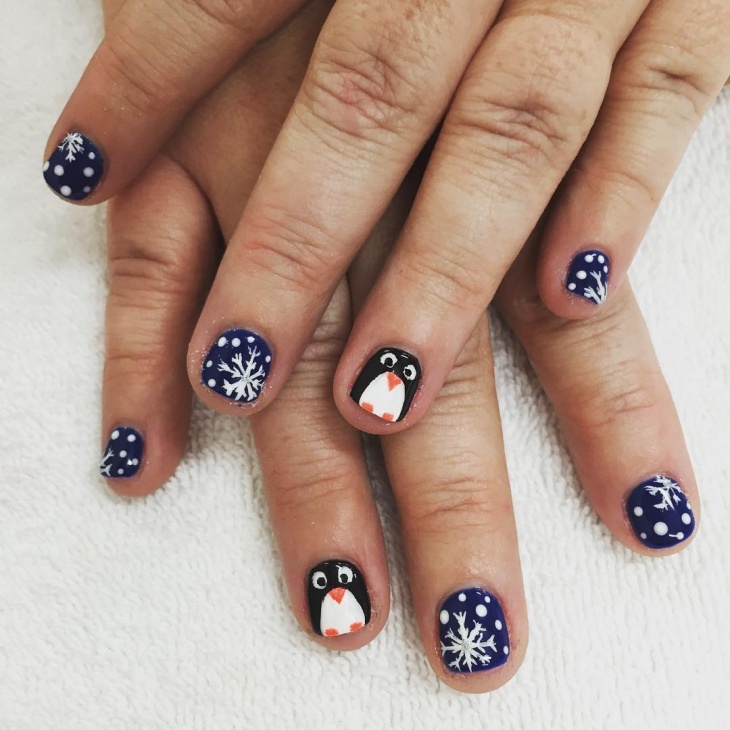 Particularly, in case of nail arts, Penguin Nail Art is consistently gaining popularity among large numbers of young girls and women. 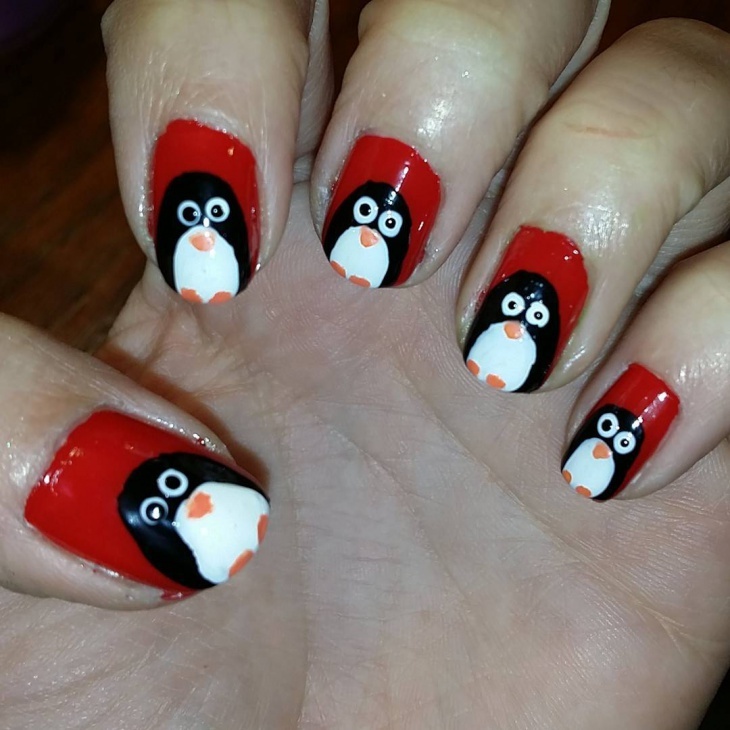 Here, we will discuss about few interesting patterns in Penguin Nail Art. 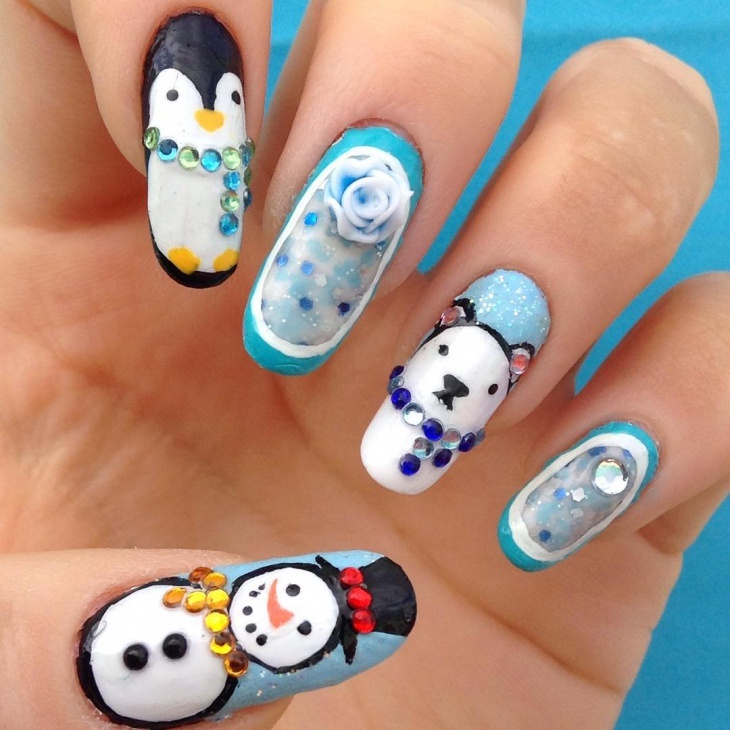 This is a special nail art design, which goes along with bright outfits. 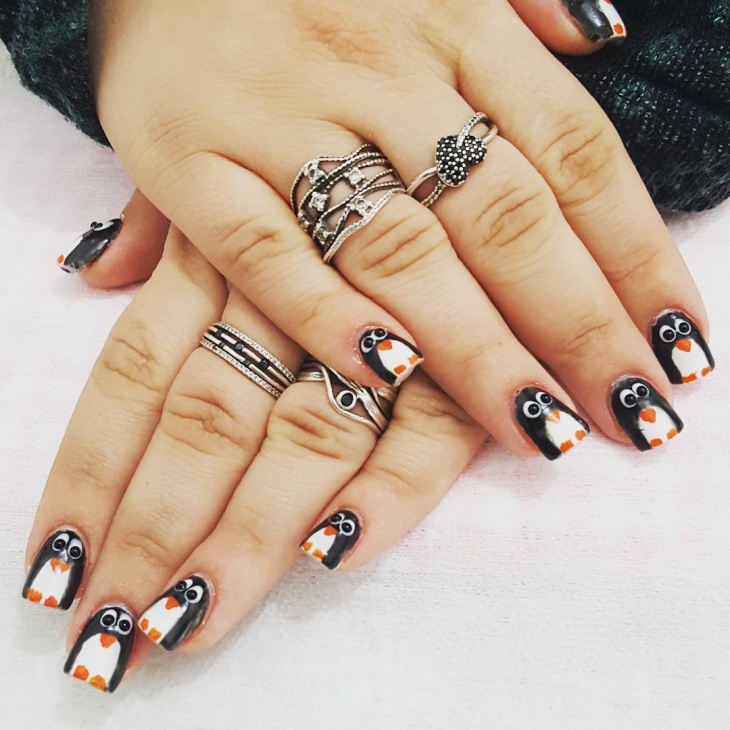 It is simple design depicting cute penguin face with a bright white color, black dotted eyes and a touch of orange in the middle. There is a light blue color on the background as border. 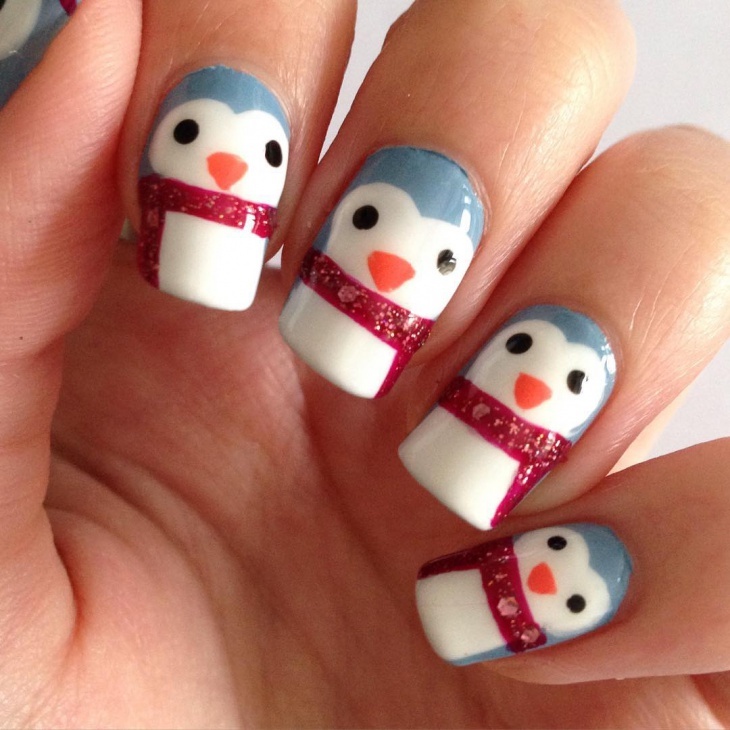 It is another unique and very attractive design, which can make your nails very much eye catching. 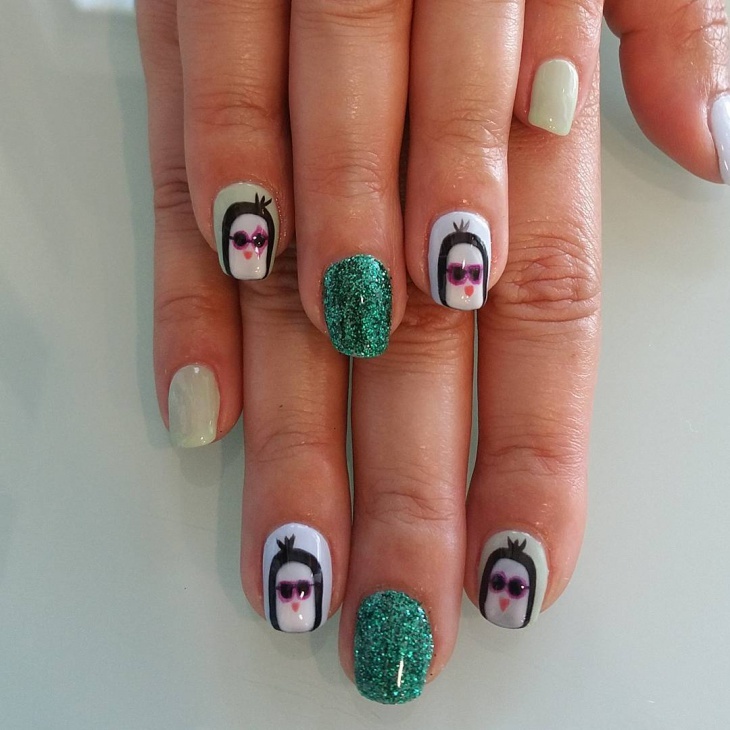 It is a one of the versions of the penguin designs in which the nail of the middle finger is painted with glittering green paint and the nails of the two adjacent fingers depicts a cute penguin with black hairs and a sort of tiny pony. The thumb and the last finger are painted dull white. This design is a perfect example of power of simplicity combined with fine design. 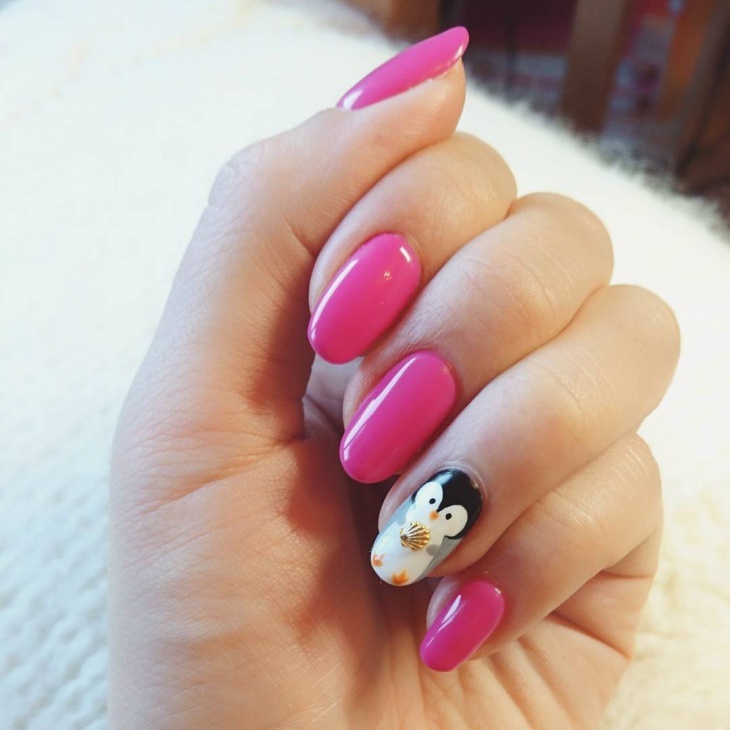 In this nail art, all the nails except for the middle finger are painted with pink color neatly. 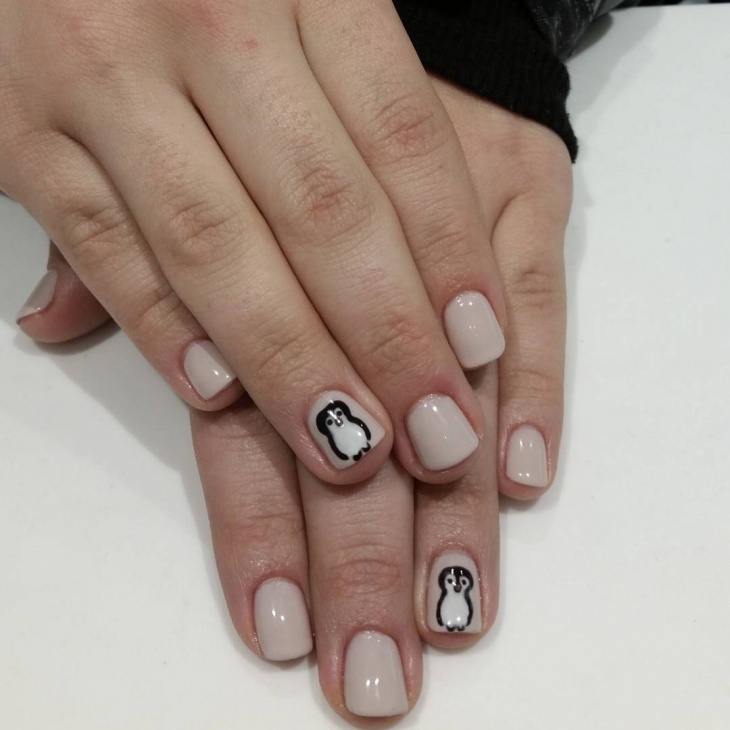 The nail of the middle finger is beautified with a penguin structure mostly in black and white with a touch of golden and orange. 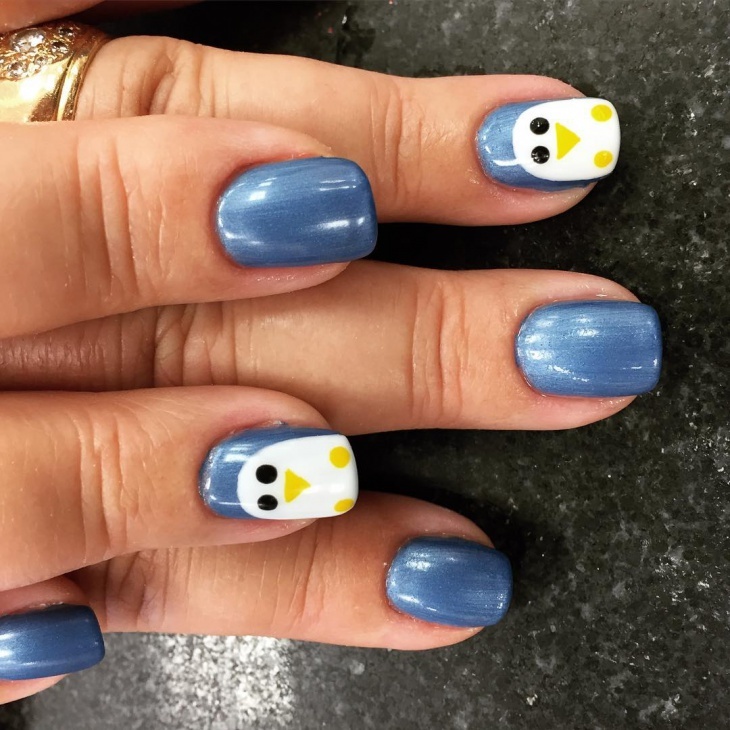 This is another very simple but very beautiful nail art design in which nails of all the fingers except the one in the middle is painted with a plain glittering light blue. 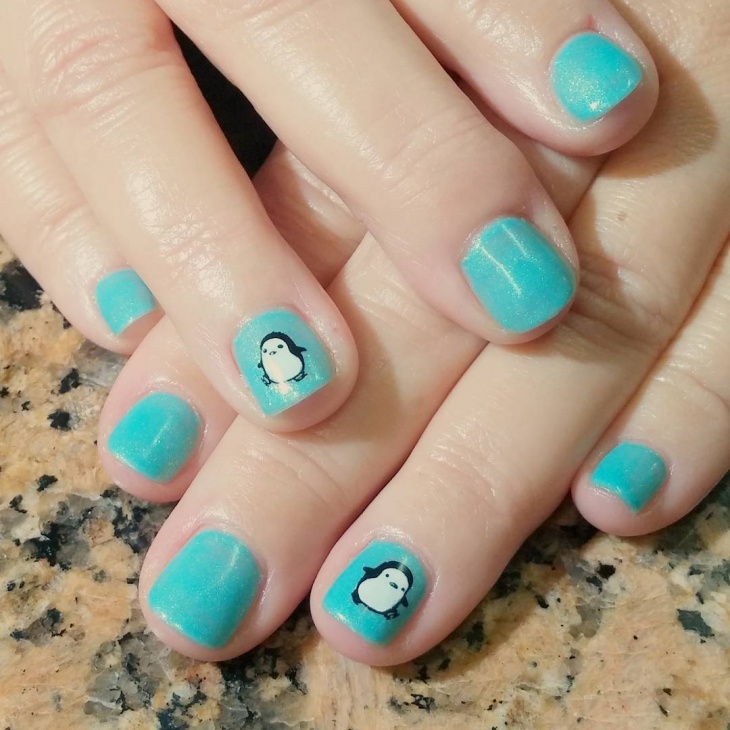 The middle finger is uses a penguin sticker on top with the same blue color on the background. This art is full of snowflakes and bright glittering blue on the background. 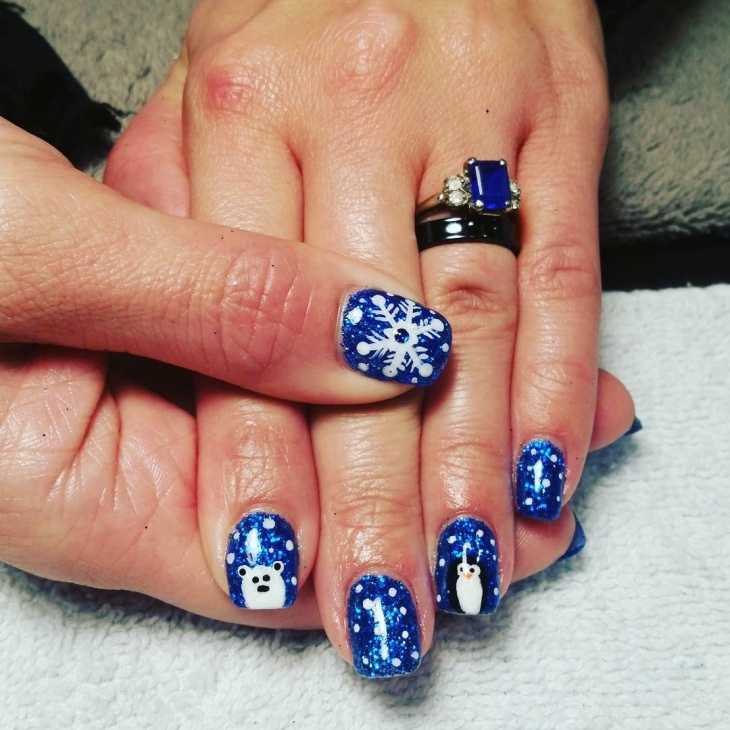 The nail of the thumb has a stone studded on the center with the projecting out snowflakes. 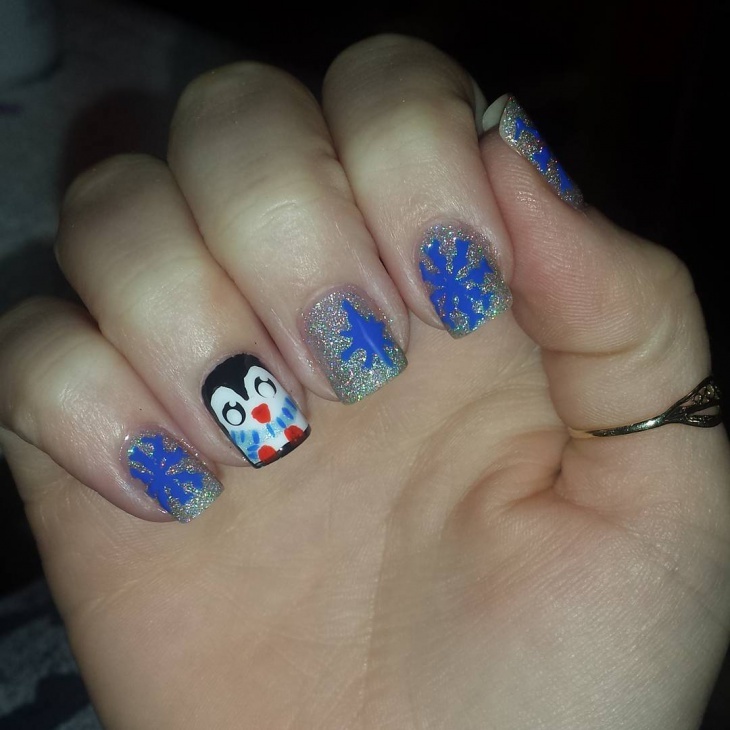 The rest of them has different types of penguins. 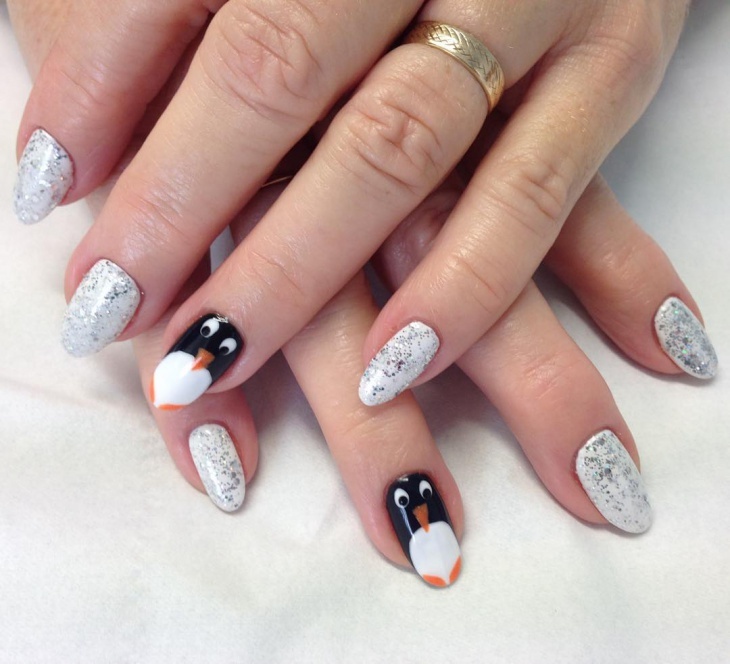 A beautiful mix style brings about the beauty of dotted style together with the penguin. 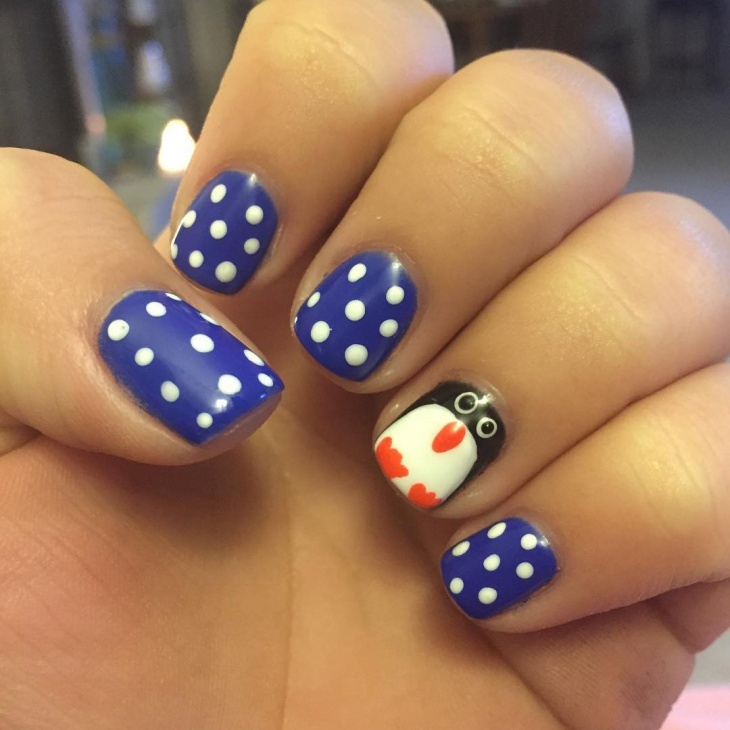 All except the nail on the middle is painted with navy blue and highlighted with bold white dots. The one, which is left, shows a typical image of penguin. 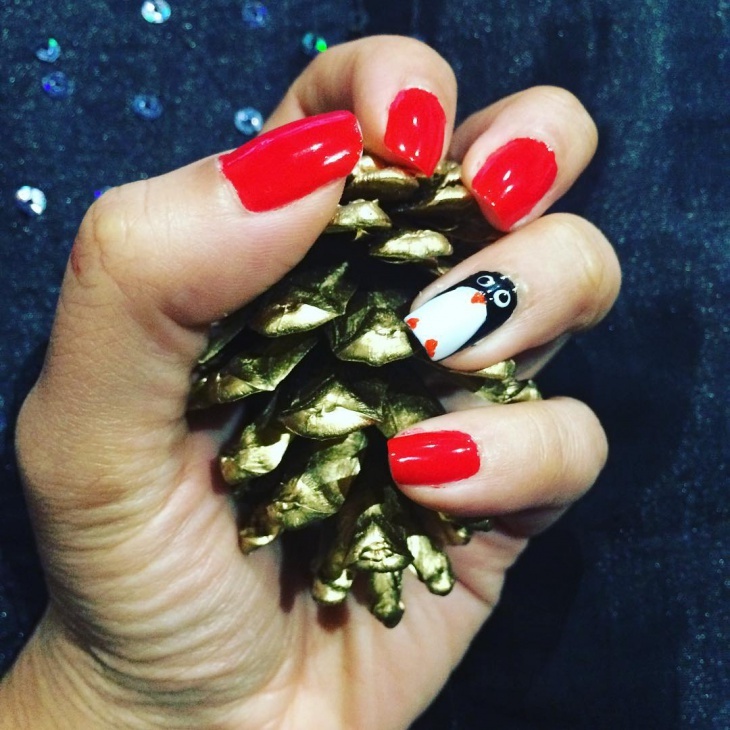 This nail art comes with a bright red color, which symbolizes the joy and love. It is perfect for special occasions, like Christmas. 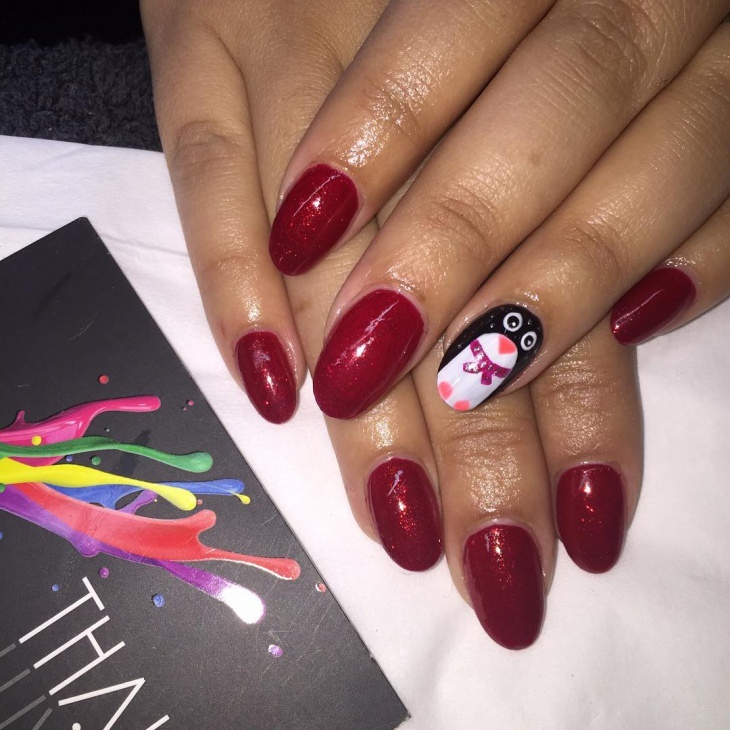 All except one of the nails is painted with plain red and one of the nails in between shows the black and white penguin with three dots of red. 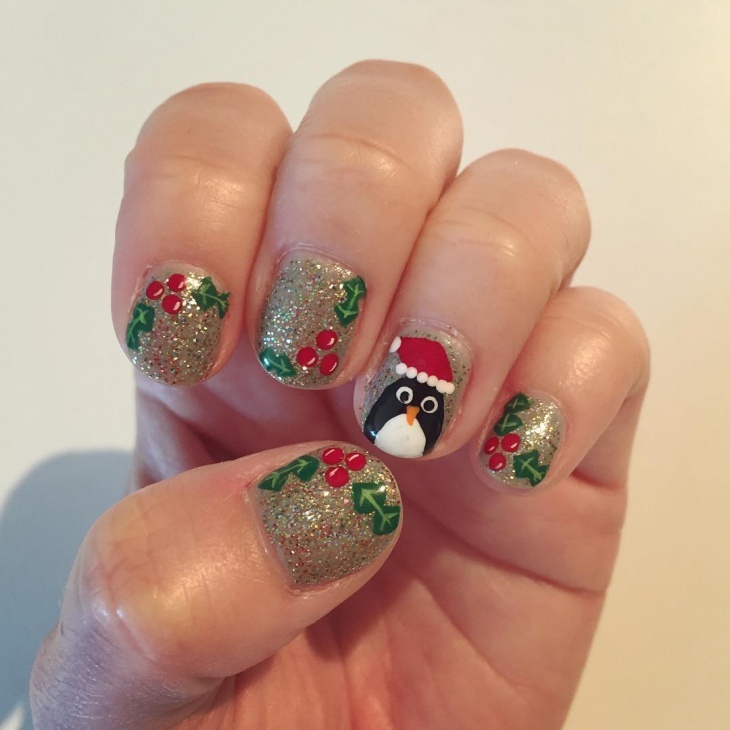 This is bit of a complex design but it looks marvelous and guarantees that your nails would be noticed in the big crowd. It depicts five different patterns one for each finger that makes it so complex yet unique. 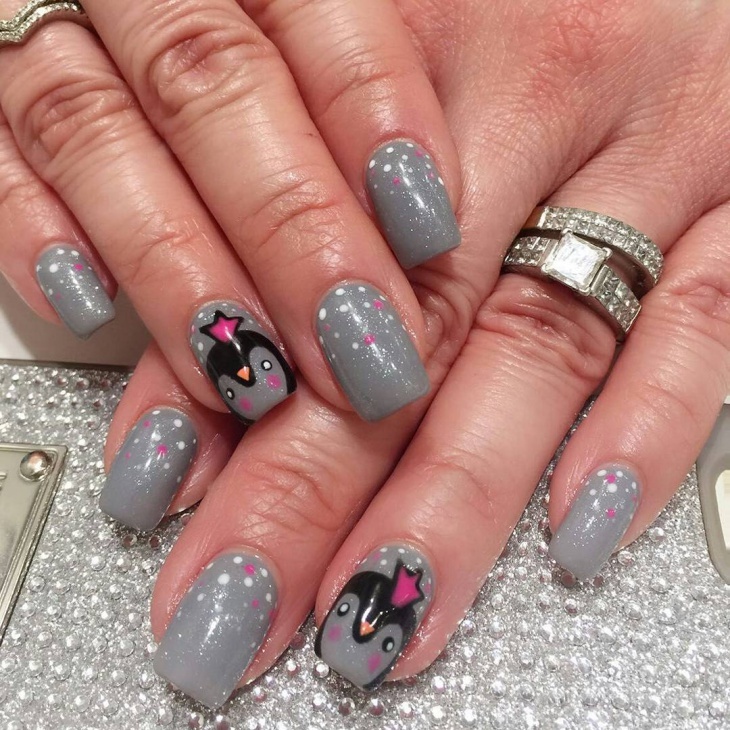 On the alternate nails you can find designs of penguins all different and the nails in between shows showy designs with light blue background. 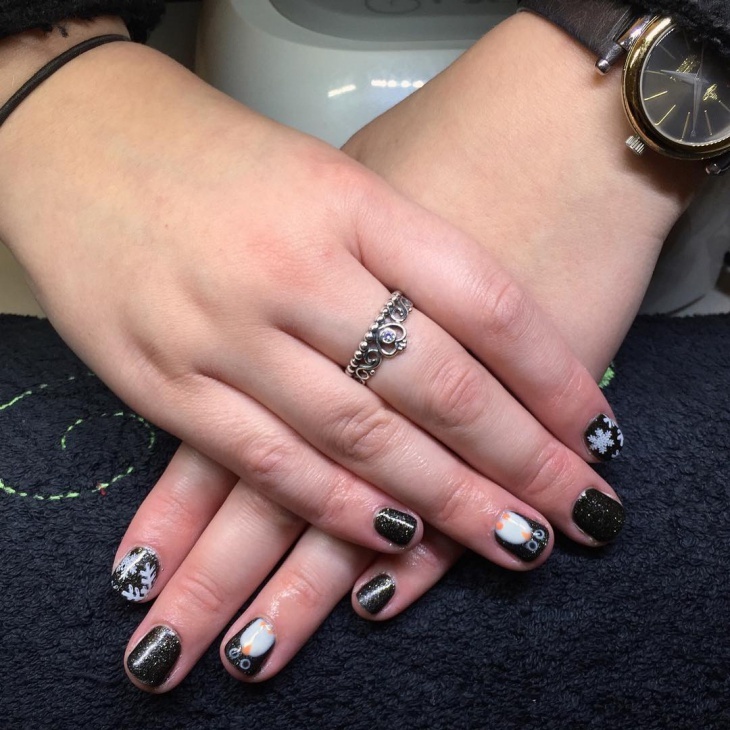 This nail art uses the contrasting effect of black and white to make the nails look attractive. There is white triangle with one of the edges pointing on top middle of the nail and rest of the part is painted with black. There is touch of yellowish orange little triangles to give it the appearance of penguin.